BAKERSFIELD, Calif. — The Bakersfield Condors hit the road for a three game swing this week. 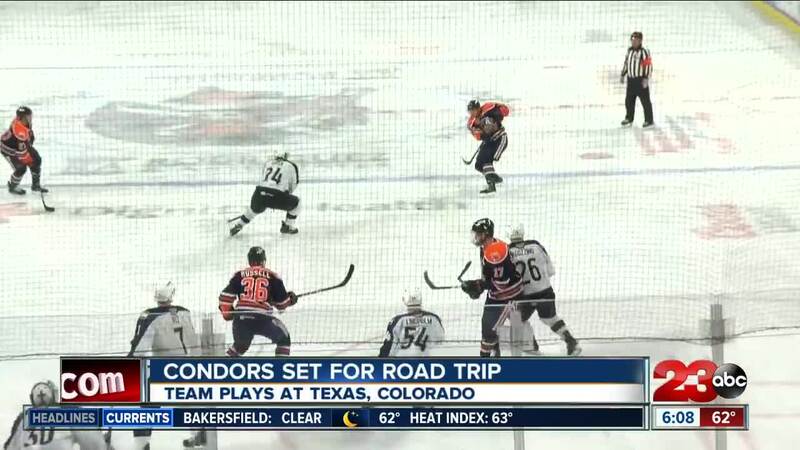 Tuesday morning the Condors left Rabobank Arena for a Wednesday night match-up in Austin, TX against the Texas Stars. Then they will be in Loveland, CO for a two-game series Friday and Saturday nights against the Colorado Eagles. The Condors are currently in a three team race for third place. The San Diego Gulls, Colorado Eagles and Bakersfield Condors are all separated by two points in the Pacific Division. The Condors have a chance to move in front of the Eagles this weekend. The Condors are currently in fifth place and one point behind the Eagles. The Condors will be back in Bakersfield Wednesday January 16th when they host the Stockton Heat during Margarita Night.